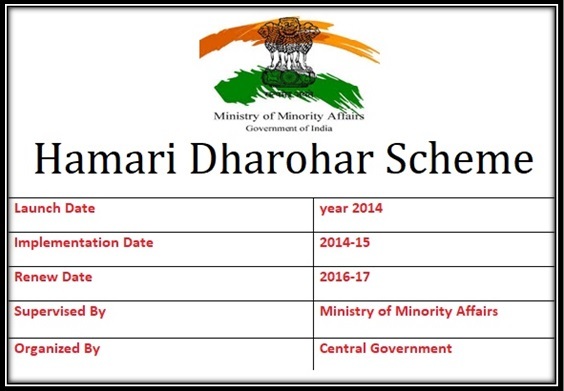 Hamari Dharohar Scheme is one such scheme to protect and preserve the rich culture and heritage of the minority communities living in India. In India, all communities can enjoy equal rights to carry out and enjoy their culture and religion. Keeping up with the same spirit, the Government of India is now following a need to curate the heritage and culture of the minorities. This is because there is a lack of knowledge and understanding of the cultures of the minority communities at present. Also, keeping in mind the present scenario, this scheme would be helpful in promoting tolerance in the country. The prime objective of this scheme is to preserve and protect the heritage of certain communities. This includes religions like Parsis, Christians, Buddhists, and other such communities. Such a curation of the heritage shall also include the curation of the art and literature that is specific to the particular community. It will also include documents etc. The aim of the scheme is also to support the promotion of various forms of expression which are unique to each community such as calligraphy. Therefore the government will help promote such forms of expression. The government’s aim is also to perform research and help the development of the communities so that much is uncovered about the history of these communities. This will help India learn more about them and it will also help them come into a state of harmony. The government’s one of the top initiatives shall be to conduct exhibitions. Through these exhibitions these communities can expose their culture to the world. The government shall also aid the curation of these exhibitions. The government, as its objectives support, is trying to preserve the literature of these communities. It is also unearthing many manuscripts and documents pertaining to these communities. The scheme also tries to keep documentations of those traditions which are not performed anymore. This means that the scheme keeps track of the oral traditions passed on through ages – so is the case with art forms. The government shall also support the minority communities for organizing seminars and workshops which are related to imparting knowledge about their culture in general. This means that any heritage related workshop or seminar shall be supported. The Ministry, in an attempt to support this scheme, shall also support the ethnic museums. These museums shall be given the task to showcase and preserve the culture and heritage. The scheme shall also extend out any other forms of support to the organization or the individuals related to protecting the minority communities or preserving or promoting them in any manner. Also, as per the scheme, certain research works are also funded to help preserve and develop the fellowship programme. This is one of the prime effects of research and development as per the objectives. From 19th to 29th May, 2016 onwards, the Everlasting Flame series of international exhibitions were held in New Delhi. These exhibitions are one of the prime examples of the achievements of this scheme. There were three branches of the exhibition – “Threads of Continuity”, “Zoroastrianism in History and Imagination” and “Painted encounters – Parsi Traders and the Community.” These three upholded the three aspects of the exhibitions. The scheme has also been successful in translating the ancient documents from Arabic to English. They have also reprinted the documents from the medieval era on Maths, Science, Medicine and Literature. They have uncovered rare manuscripts which were not known to us. These were kept at the Dairatul Maarifil Osmania, Osmania University of Hyderabad. There are many more of such manuscripts uncovered. The official website of the program is http://www.minorityaffairs.gov.in/ – you will find more details about the program on this website.